The Green Sheet :: E-Magazine :: Is cash discounting next big wave in merchant services? Is cash discounting next big wave in merchant services? Merchants long have decried the cost of credit and debit card acceptance, often locking horns with the card companies over interchange. Now there's a movement afoot among ISOs, merchant level salespeople (MLSs) and solution providers to help shift the cost of acceptance to cardholders who choose to pay with their credit and debit cards. And of the options available, cash discounting seems to be carrying the day. Gas stations in many states have been offering discounts to cash customers for years. But most other merchants felt hamstrung by consumer protection laws and card brand rules that discouraged the practice. That all changed with the Durbin Amendment to the Dodd-Frank Act, which in addition to requiring the capping of debit interchange also gave merchants the go-ahead to offer discounts or other incentives to customers using certain payment methods (like checks or cash) provided the discount program is "conspicuously disclosed." The Durbin Amendment also stipulates that payment card networks cannot restrict merchants from offering customers discounts for using one method of payment over another. Under a cash discounting scenario, merchants mark up prices on all their products and services to cover the cost of card processing, then offer discounts equal to the markup to customers choosing to pay by cash. The net effect is that these businesses eliminate nearly all card processing fees. According to those familiar with cash discounting programs (and an informal survey by this reporter of 20 friends and colleagues), consumers overwhelmingly like the idea of discounts for cash, and they understand businesses incur costs when customers pay with credit and debit cards. "Payments professionals are struggling to find ways to accommodate merchants who are clamoring for relief" from card processing costs, said Holli Targan, a partner in the law firm Jaffe Raitt Heuer & Weiss. While cash discounting has been allowed for several years, Jill Miller, a partner in the law firm Varnum LLP, said she's seen a recent uptick in inquiries from ISOs, MLSs and other merchant services firms that want to offer surcharging and cash discounting support to merchants. "Over the past 12 months we've seen a lot more client interest," she said. James Shepherd, CEO of CCSales Pro, a training and consulting firm based in Altoona, Pa., said he, too, has received a lot of inquiries about these programs but added that he counsels against surcharging. Cash discounting is a simpler option to sell because it's legal nationwide, can be applied to all card payments and doesn't' carry the negative connotations of a surcharge. "Merchants are demanding change, and ISOs and processors are responding with these [cash discount] programs," Shepherd added. Cash discounting on its face can seem like surcharging. "It's sort of the flip side of the coin," Targan said. But, she was quick to add, there are distinct differences. Chief among these are laws in 10 states prohibiting businesses from surcharging one particular method of payment, like credit cards (see accompanying sidebar for details). Rules enforced by Mastercard and Visa create other differences. The bankcard brands have strict rules against surcharging debit card payments, for example. Plus they require merchants to register with them (through their acquirer) 30 days in advance of the start of a surcharge program. Visa and Mastercard also impose program requirements, such as specific customer disclosures, and capping surcharges at 4 percent of the ticket or actual merchant fee, whichever is less. With cash discounting programs, there are no limits on how much a business marks up its prices and discounts for cash, and merchants have no obligation to notify the card brands of their plans. "When cash discounting is done correctly, the processor collects a service fee [which effectively comes out of the price increase] and uses that to cover all interchange and markup," Shepherd said. There are disclosure requirements associated with cash discounting: merchants must post signs at entrances to their establishments and at their checkouts notifying customers that prices reflect costs to card-paying customers and that discounts are available for cash-paying customers. The markup/discount also gets printed on customer receipts. Unlike surcharging, however, no card brand rules dictate the wording and font sizes used for printed disclosures, Targan noted. Employees also need to be trained in explaining to customers that they can take discounts if paying with cash. "There's a whole educational process on the back end," said Matt Nern, vice president for sales and marketing at SignaPay. A merchant services provider headquartered in Irving, Texas, SignaPay introduced PayLo POS in 2017 to support cash discount programs. When an ISO or MLS partner signs a merchant for PayLo, SignaPay works with the merchant to ensure the business and its employees understand how the program works, Nern said. The firm even provides employee training videos. Miller said working with a technology provider that specializes in supporting cash discount programs is important for ISOs and MLSs. "There are companies out there that have done all the background work and that have the systems in place" to assure the programs don't run afoul of federal, state and card brand rules, she said. Cash discounting has significant appeal, especially among smaller merchants "There is definitely a market for this. But it's not for everybody," said Dee Karawadra, president of Impact PaySystem LLC, a Cordova, Tenn.-based ISO. For ISOs and MLSs, "It's really just a matter of identifying [business] niches that might want this kind of service," Miller said. Experts interviewed for this article cited several merchant types for which cash discounting holds appeal. These include businesses with predominantly small-dollar tickets (think nail salons, dry cleaners, coffee shops, and takeout/delivery services), as well as some specializing in higher-ticket items (for example, automobile repair shops, plumbers, veterinarians and daycare centers). "It all comes down to people truly understanding the concept," Nern said. Here's how the process works. A merchant negotiates a per-item rate with the ISO or MLS. The going rate for most small merchants hovers around 3.99 percent; larger merchants often can negotiate rates as low as 3.29 percent, Shepherd said. It is not uncommon for ISOs and MLSs to offer a flat per-transaction fee to businesses with small-dollar sales (like coffee shops) that want to offer cash discounts, several experts noted. Merchants also pay monthly fees, usually between $39 and $69. 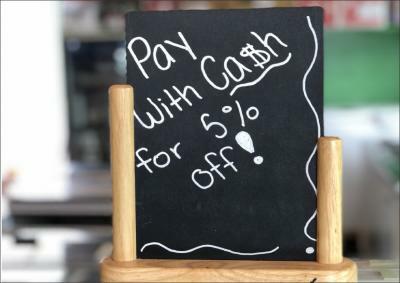 Once merchants sign up for cash discounting, they acquire the necessary signage, adjust prices to reflect the card processing rate markup, and train employees on how to explain to customers that a discount is available for cash payments. On the back end, processors deduct the negotiated fee from each ticket and deposit the remaining proceeds from the sale into merchants' accounts. Typically, the fees are held in escrow until the end of the month, whereupon the processors pay all accumulated interchange and related fees, and splits what's left with the ISOs. Nern said about 60 percent of monthly new merchant deals SignaPay signs are for its cash discount program. Shepherd said he's heard similar reports from ISOs and MLSs that understand the business case and are gung-ho on selling cash discounting. But many ISOs and MLSs aren't yet keen on cash discounting. "The issue is that it's a completely different pitch than standard processing, so reps are either selling cash discounting or not selling it," Shepherd said. Both Nern and Shepherd have found that the draw for ISOs and MLSs that understand cash discounting is better residual streams. "I would estimate the average markup is 150 to 200 basis points on these accounts, and so the profits are huge for the ISO and rep after covering the interchange costs and schedule A costs," Shepherd said. Nern claimed earnings can be as much as three times the residuals from a traditional card processing account. He said that in virtually all cases SignaPay has seen monthly card volumes for merchants that are consistent or up month over month once on PayLo POS. Merchants can change their minds and switch to traditional processing, he noted. Shepherd predicted a groundswell of merchants offering cash discounts as more ISOs and MLSs catch on to the revenue opportunities. "I wouldn't be surprised if 25 percent of all new physical location retail merchant account sales made in 2019 were cash discounting," he said. What's keeping that from happening today? "Reps don't know how to sell it," Shepherd said, adding, "ISOs don't seem to understand that there is no downside for them." Targan didn't point to any downside, but she said ISOs and processors need to be sure they are indemnified and held harmless for litigation that might arise from a client's cash discount program. "We recommend that they enter into agreements with merchants" detailing the purpose of the program and their responsibilities for complying with applicable laws and regulations, she said. "It can be as simple as a one-page agreement." Surcharges are additional fees businesses assess customers who pay by credit card. For decades, Visa and Mastercard banned the practice of merchant surcharging, but they relented under terms of the 2011 settlement of a lawsuit in which millions of merchants challenged interchange pricing. The card companies also impose several requirements on surcharging, including detailed disclosures and limits on assessments. While Visa and Mastercard make accommodations for surcharging credit card payments, 10 states have outlawed the practice: California, Colorado, Connecticut, Florida, Kansas, Maine, Massachusetts, New York, Oklahoma and Texas. Several of those state laws, including statutes in California and New York, have been successfully challenged in federal courts. In both of those cases, which are now going through the appeals process, the courts determined that the bans restrict free speech that is not misleading. "We expect all state laws [that ban surcharging] will be struck down on free speech grounds," payments attorney Holli Targan said during a panel discussion at a Midwest Acquirers Association event in July 2018.